WASHINGTON (Reuters) – A federal judge ruled on Thursday that Congress in its fight with the Bush administration can subpoena current and former top White House aides in its investigation over the firing of U.S. attorneys. U.S. District Judge John Bates, who was appointed to the bench by President George W. Bush, rejected the administration’s arguments that the aides were immune from such subpoenas and that Congress cannot force them to testify or turn over certain documents. In a lengthy ruling totaling nearly 100 pages, he rejected the administration’s request to dismiss the lawsuit that had been filed by the House of Representatives Judiciary Committee in March. The lawsuit seeks to get testimony or documents from White House Chief of Staff Josh Bolten and former White House counsel Harriet Miers. 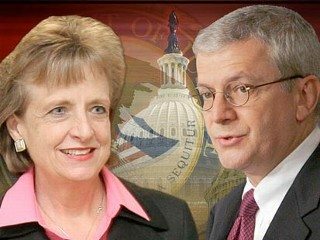 The lawsuit charged that Bolten and Miers, cited by the House for contempt of Congress, defied subpoenas by refusing to testify or provide documents in the long-running investigation into the administration’s 2006 firing of nine of the 93 U.S. attorneys. It marked the first time the House or the Senate had ever filed a lawsuit to enforce a subpoena aimed at the White House. But House Judiciary Committee Chairman John Conyers viewed the decision as a victory for Congress. “Today’s landmark ruling is a ringing reaffirmation of the fundamental principle of checks and balances and the basic American idea that no person is above the law,” the Michigan Democrat said in a statement. Disclosure of the firings had prompted charges by Democratic lawmakers that the dismissals were politically motivated and led to the resignations of a number of top Justice Department officials, including the departure under fire nearly a year ago of Alberto Gonzales as U.S. attorney general. Bates ruled that Miers is required to testify under the subpoena, but she still may invoke executive privilege in response to specific questions. He also ruled that Bolten and Miers must produce all documents requested by the subpoena and must provide a specific description of any documents withheld based on executive privilege — the power claimed by the president to keep private certain information regarding presidential decision-making. The administration had argued that senior White House aides had immunity from being compelled to testify to protect confidential advice they provide a president. Even the appointed judges won’t side with their boss They realize how corrupt the administration is.